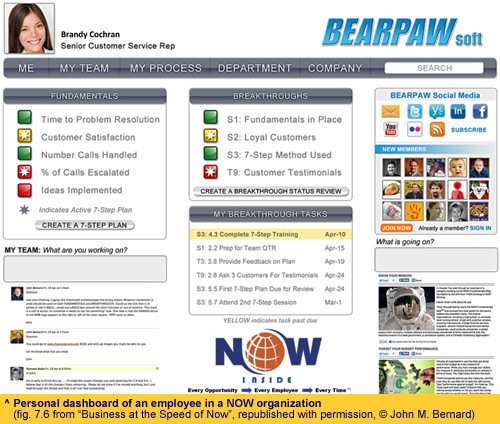 In his book “Business at the Speed of Now”, John Bernard describes an engaging, transparent and real-time management system. Particularly interesting is the contribution of social media and cloud computing. In a "now company", all employees know exactly their role in end-to-end business processes, keep score how well they are performing, and are allowed to make decisions autonomously. The result is a responsive organization, with the power and magic to say ‘yes’ to customers immediately! Bernards ideas connect with a current management trend: Get rid of the barrier between thinkers (management) and doers (workforce). Even when you create a mission for your company every opinion counts, he states. In Holland, we have different train companies. Since last year, you have to check-in and out electronically. There are many people making mistakes, since the check-in/out posts of different train providers are standing next to eachother. A few weeks ago, after arrival in the city of Groningen, I wanted to check-out by holding my card for an NS-post. However, mistakenly I checked-in at Arriva, which obviously costed me 10 euro. Due to some software-bug I couldn’t correct this myself, so I went to the service desk of Arriva. The desk clerk scanned my card and could immediately see what went wrong. ‘Can you give me back my 10 euro’, I asked. ‘No, she said. But you can go to our website, and fill in a form’. Why couldn’t she simply decide to give me back my money? She had all the information she needed, but apparently no authority to act. 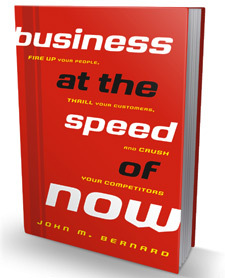 When I read the book “Business at the Speed of Now” by John M. Bernard, I remembered this experience. I think Bernard would call this an example of THEN behavior. In a THEN organization, employees have no authority to think and act, since their managers stand in their way. Incidents like the one with Arriva do not need to be characteristic for an organization as a whole. That said, a few months earlier, I had a completely different experience with Ziggo, a provider of digital television in the Netherlands. After having problems to install their hard-en software, I called their helpdesk. They immediately guided me through the installation process, and even insisted to stay on the phone until everything was working correctly. This is typical for a NOW organization, as described in Bernards book. Every employee has the ability to help customers immediately. 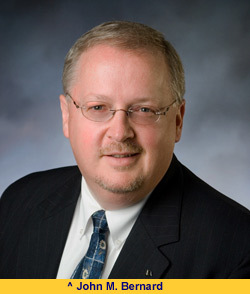 John Bernard worked in various roles between 1980 and 2007 in companies like Omark Industries, Electro Scientific Industries, Floating Point Systems and StanCorp Financial Group. In 2008, he started a consultancy firm, with the interesting name Mass Ingenuity. This refers to mass engagement and mass action of all the people in a company. Why is that needed? First, as has been said often before, this is the era of mass customization. Products and services should meet unique needs of customers. Second, the so-called entitlement or millennial generation [born between 1976 and 2004], a generation literally living in the now, is becoming more and more influential. These people not only want what they want, they also want it now. When you say ‘no’, they feel as if they were robbed of something irreplaceable, their time. As a result, they will certainly not recommend you company to others, says Bernard. + The role which social media and cloud computing can play on becoming an agile and responsive organization (a NOW organization) is explained. + The book contains many examples, be it anonymous. + The book gives a complete overview of how you could manage a NOW company, by presenting many existing management theories like Lean, Six Sigma, TOC and BPR in a simple and clear way, and combining them. This is especially handy for people not familiar with these theories. - The other side is that these people might get the impression that this approach is unique for the consultancy firm of the author. - The possibilities of cloud computing, in the current state of maturity, are overexaggerated. To deal with this we need to transform our companies from THEN, with highly controlling managers and as a result frightened and slowly reacting employees, to a NOW organization. This idea is not completely new, earlier this was called an agile or a real-time organization. However, Bernard adds the role of social media and cloud computing. Especially that makes his book very interesting to read. In each chapter of the book, one aspect of a NOW organization is discussed. At the end of each chapter a NOW Speedometer can be filled in, to measure how ‘fast’ your company is concerning the aspect described. Bernards ideas connect with a current management trend: Get rid of the barrier between thinkers (management) and doers (workforce). One example is Philips. Recently, CEO Frans van Houten declared in some Dutch newspapers that he wants to make his company faster and more innovative, by letting his employees act more like entrepreneurs. A good example in his eyes is a local Philips-team in Singapore. They tendered successfully for supplying lighting and medical equipment to a new hospital. What does it look like to work in a NOW-organization, doing business ‘at the speed of now’? Employees like Katy understand the context in which they are working. They know their role, their position in an end-to-end process, and they know how they can contribute personally to the mission of their company. Employees keep score themselves, to know how well they are performing. Therefore there is no need al all for them to fear the results of assessments. Employees have the authority to make decisions autonomously, be it within the limits of a structured organization. To do that they should know the context in which they are doing their job (see point 1). In addition, they should know the facts needed to make decisions (see point 5) and their accountability. In addition, fear to act and to disclose problems should be eliminated, by creating a transparent and no-blame culture. Managers should train and coach their people to solve problems, instead of standing in their way. Social media cannot only be used to stay in contact with customers, they are also very useful internally to get direct access to people who can help to solve problems immediately. Cloud computing is a cost-effective means to give workers direct access to the resources and data they need to solve problems in the instant they arise. Besides the insights presented in a nutshell above, in the book many existing management theories are combined and presented in a clear way. Together, these form a complete ‘NOW management system’, states Bernard. In essence his system is a mixture of Lean management (value stream mapping, cascading Key Performance Indicators, standardized problem-solving, mentor-mentee management approach), Six Sigma management (fact based decision making, project management), TOC management (focus on constraint elimination) and Business Process Re-engineering (process-oriented thinking). A bit conflicting is that Bernard wants that all thinking, planning and execution is fact-based, in a way which is done in a Six Sigma organization. On the one hand he pleads for a creative organization with decentralized decision-making, but on the other this should all be done in a disciplined and structured way. This goal seems not easy to achieve! In addition this raises questions about the empowerment of employees to break certain rules, to make it possible to say yes to customers with special needs. Of course, also some critical remarks can be made. First, I think the approach of Bernard asks for highly skilled and very responsible people. Second, Bernard puts a strong focus on using IT and the internet to support mass-customization. This may work very well for companies making products like calendars or visiting cards, but what if you are for example producing food? Third, I think that the advantages of cloud computing are overexaggerated and the minuses underestimated. For example, it is true that big cloud providers like Google and Salesforce can invest heavily in security, but that does not necessarily mean that their software is safer than for example a private internet-enabled ERP-system. It is for a hacker far more interesting to hack Google then one single medium or small company. Not only variation in production but also in management should be reduced. What you need is clear direction, a connection of every job to the mission, and clear accountabilities. Visibility is not only about displaying production problems, it can also encompass knowing who can help with problems. Social media can help in that respect. Do you need help with Change management & Leadership?